Brilliant views of Danube River destinations are waiting on your European river cruise, made even more beautiful with two nights in the Hungarian capital city of Budapest. Before embarking on your cruise through Austria and Germany, enjoy your stay in the "Pearl of the Danube"-Budapest-with an Avalon YourWay vacation. Enjoy superior hotel accommodations with complimentary breakfast, an expert Local Guide, and courtesy hotel-to-ship transfer. You’ll enjoy a guided tour of Budapest, including the iconic Heroes’ Square. You’ll have free time to get to know the city’s cafes, shops, magnificent architecture, and thermal baths! Embark on your Danube River cruise in Budapest to sail to Vienna-the City of Music. You’ll marvel at the sights with a guided city tour of Vienna’s gilded landmarks-including the Imperial Palace, the world-famous opera house, and stunning St. Stephen’s Cathedral. Sail to Dürnstein to walk in the steps of Richard the Lionheart. You may choose a guided hike to the castle where he was held during the Crusades, and behold the brilliant view of Austria’s Wachau Valley from above. 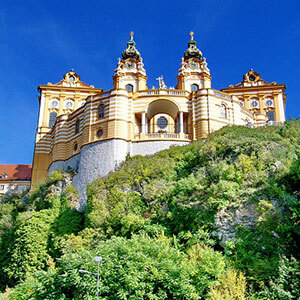 Next, the magnificent Benedictine Abbey of Melk awaits, with its frescoed ceilings, sculptures, library, and ornate pipe organ. Join us on board for a wine tasting of Wachau Valley vintages. You’ll cruise to Passau, Germany, where the Danube meets the Inn and Ilz Rivers, for guided walking tour of the captivating, baroque "City of Three Rivers." Visit the Bavarian town of Regensburg to see medieval sights, including the Old Town Hall and the fortress entrance built in 179 AD. Later, join us for a beer tasting on board. Once docked in Roth, hear a fascinating onboard lecture of the impact of the Main-Danube, then take your pick of included excursions-a tour of Roth’s medieval houses, streets, and town hall; guided sightseeing in Nuremberg, or a tour of the notorious Nuremberg Rally Grounds of the Third Reich. Discover history, art, food, and music on the beautiful Blue Danube. Day 1 Budapest: welcome to Budapest!